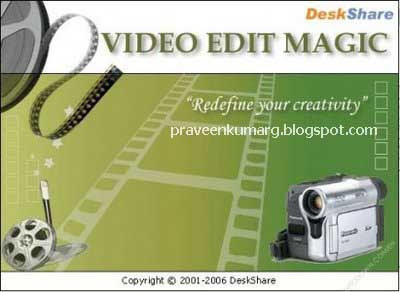 Video EditorsVideo Edit Magic makes it easy to join, split, crop, trim, modify color, and merge your video files. It includes more than 150 built-in transitions, making it ideal for hobbyists and professionals to turn ordinary videos into works of art. A unique benefit of Video Edit Magic is the volume track which is displayed as a volume graph allowing you to change the volume of audio clips at any point from 0% to 400%. You can create fade-ins, fade-outs, Doppler effects, and almost any volume effect that may have required predefined effects. – Capture videos using any USB or FireWire input device. – Edit the audio and video components of a single media file separately. – Give effects to your videos. – Decorate your videos with more than 150 unique transitions. – Overlay one video over another. – Make movies in AVI, MPEG, WMV, WMA, QuickTime, and DV AVI. – Add a background score/voiceover to your video file. – Join multiple media files together. – Combine multiple file formats on the same timeline. – Incorporate text titles in your videos. – Trim your videos and audios. – Create VCD and DVD format files. – Change the color and contrast. – Zoom or rotate video angle. – Export your videos to any Digital Video Camera.